Posted by Pam in KC in Oklahoma Backroads. Tomorrow I trim and start binding. Posted by Pam in KC in designwall, dwr, Oklahoma Backroads. The wall still has bits and pieces of what was up there last week. 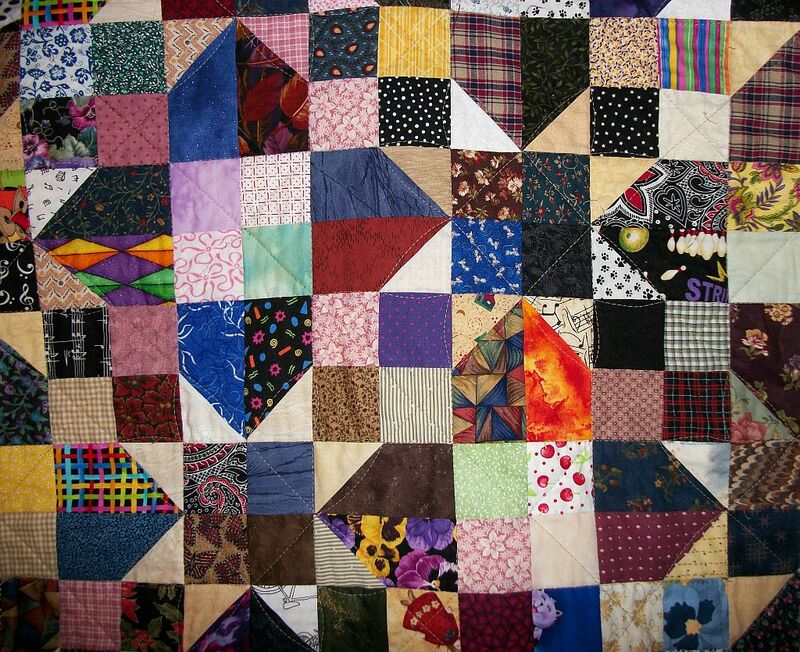 However, this past weekend, and into the foreseeable future, I’m quilting, not piecing. I’ve completed 5 of the 7 rings on the second row of the DWR. 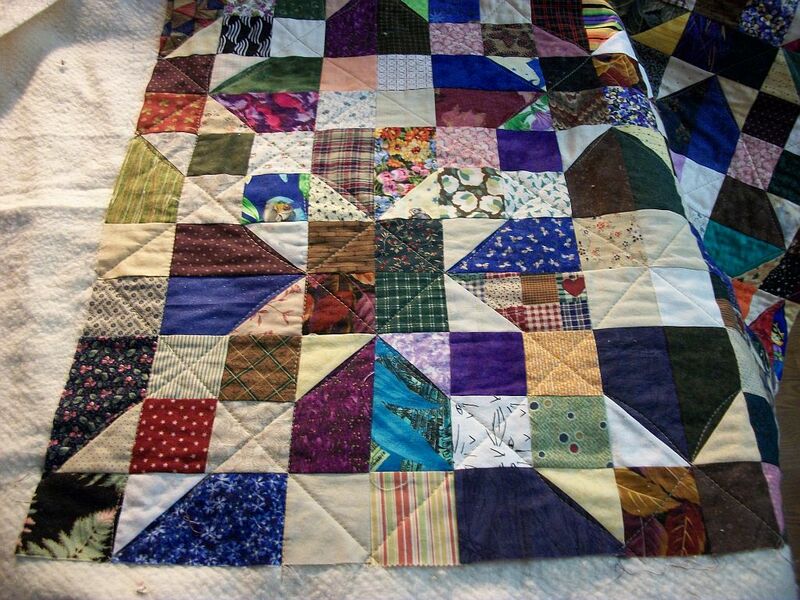 When I wasn’t hand quilting, I was machine quilting on Oklahoma Backroads. 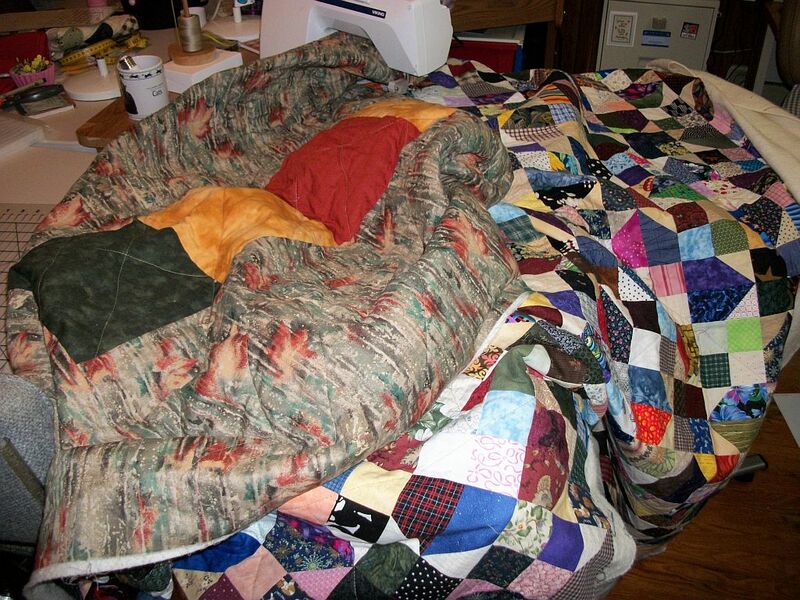 There’s enough quilting to hold the layers together through repeated washings, but I’m going to add a bit more. 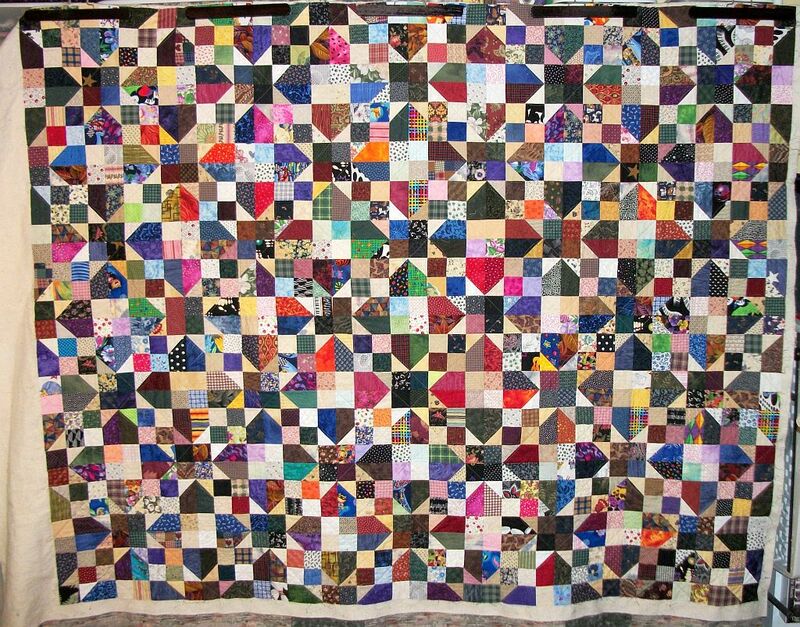 I plan to stitch in the ditch (or in the vicinity) across the width and down the length of the quilt, bowing out at the star points. My hope is to highlight the stars. Too bad I didn’t realize this was my plan before I had the first layer of quilting done – stitching diagonally through the light chains. Check out what others are doing by following the links over at Judy’s. 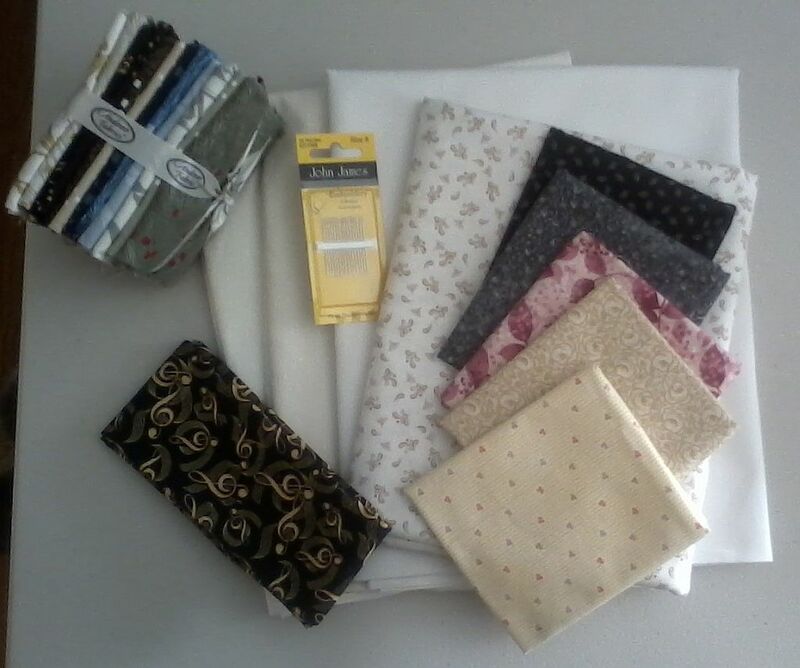 It’s amazing how much the fabric usage will jump when you make a backing. Combine that with a bunch of the SBS blocks and a couple of swap blocks and the number is quite nice. Nothing fabric came in so that helps as well. That’s Oklahoma Backroads on the sewing machine. I’m probably about 1/3 of the way through it. 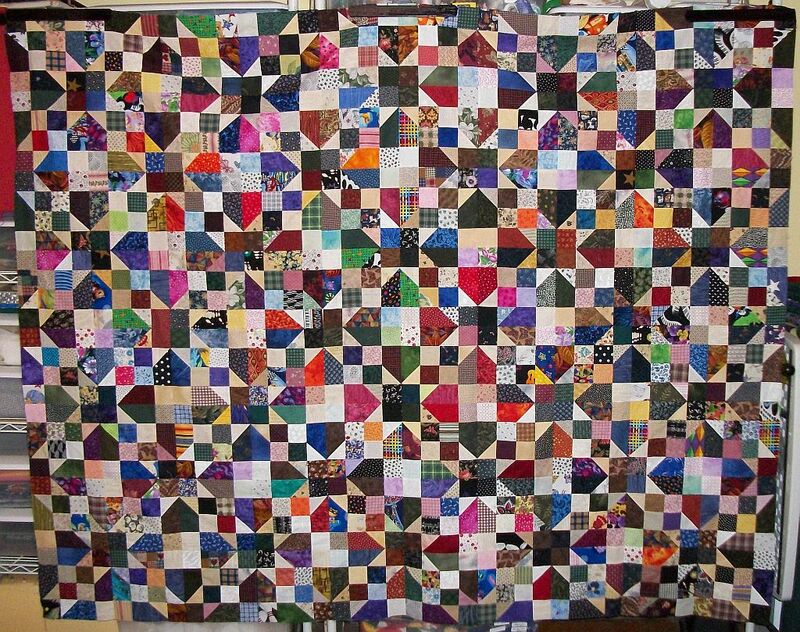 I finally decided how to quilt it — I just hope I get the effect I was going after. 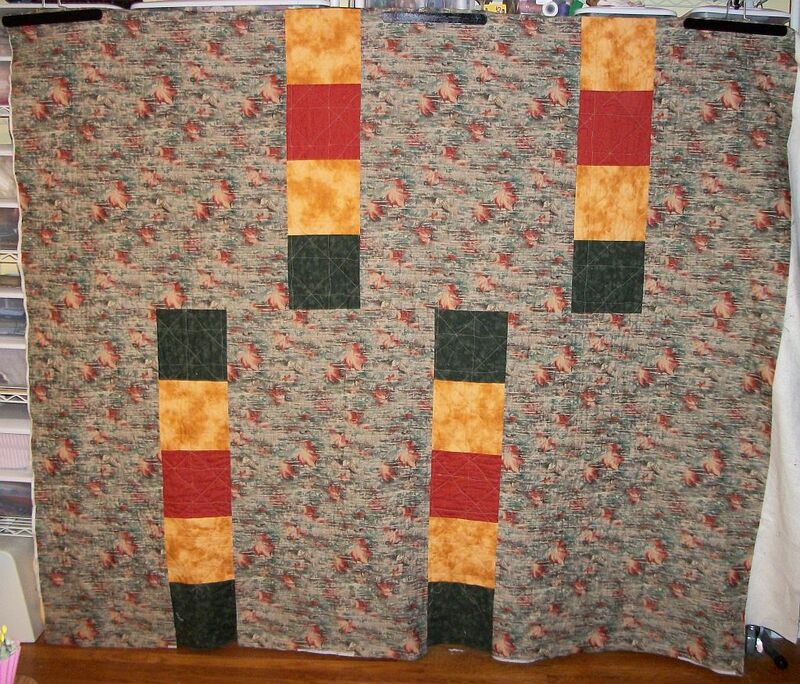 I really do need to learn to do free motion quilting. Posted by Pam in KC in block swaps, Oklahoma Backroads. 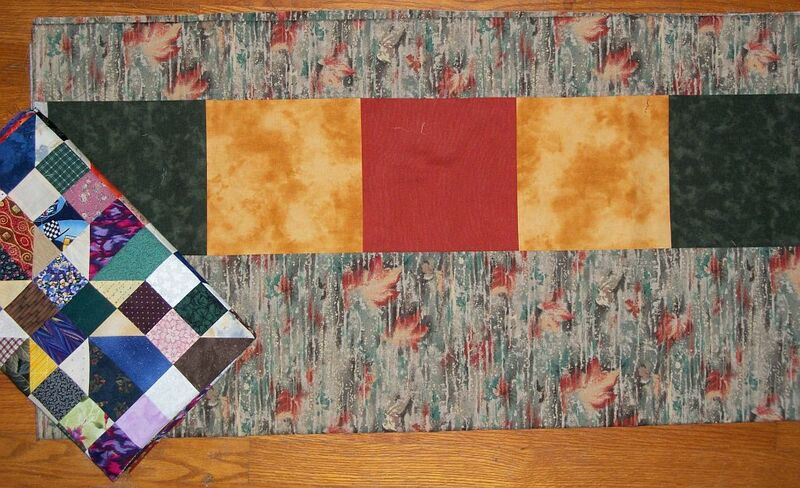 I found a length of leaf fabric in my stash — I think I got this from S last year when she was clearing out her stash. It wasn’t quite long enough to be a backing for Oklahoma Backroads, so I lengthened it. I’ve got a spool of khaki thread which will blend nicely with both the front and the back, so now all I have to do is sandwich the quilt and decide how I’m going to quilt it. 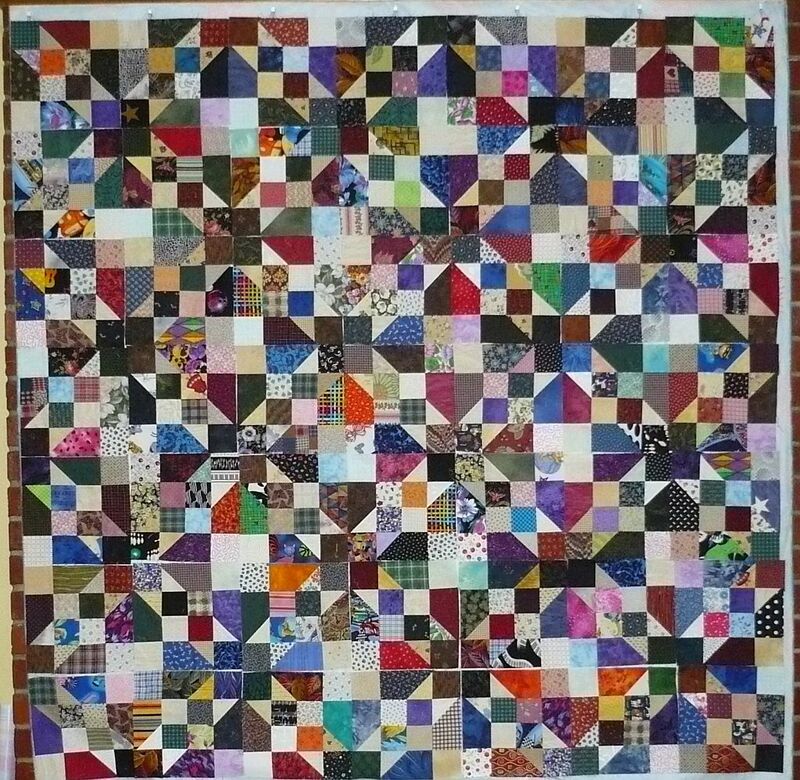 Since I hope to start quilting tomorrow, I needed to finish up any piecing I wanted to do. These are the two swap blocks, so now I need to get them in the mail. Off to quilt on the DWR for a few minutes. 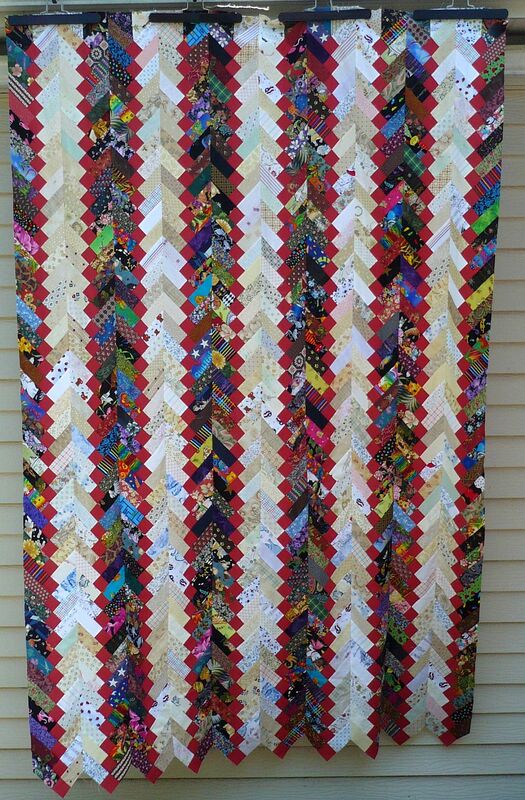 This evening I finished my Oklahoma Backroads quilt top. I used Bonnie Hunter’s pattern, but made it smaller. This top finishes at 64 x 80. 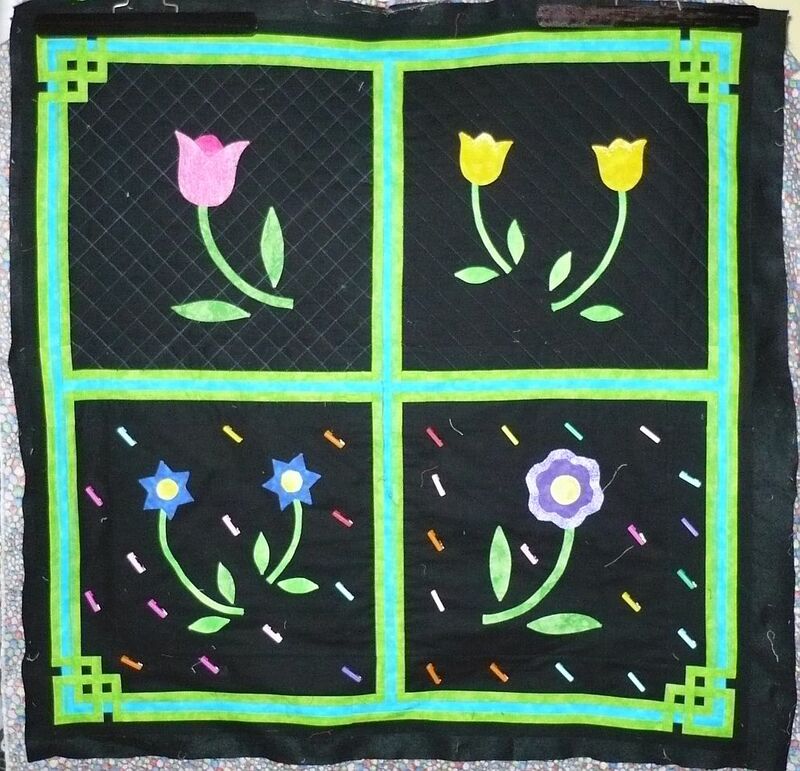 When I started this quilt, I did not intend to have borders. But the closer I got to finishing it, the more I began to second guess myself. Three people commented on yesterday’s post about the border and it’s 1 for a small red border and 2 to just bind. 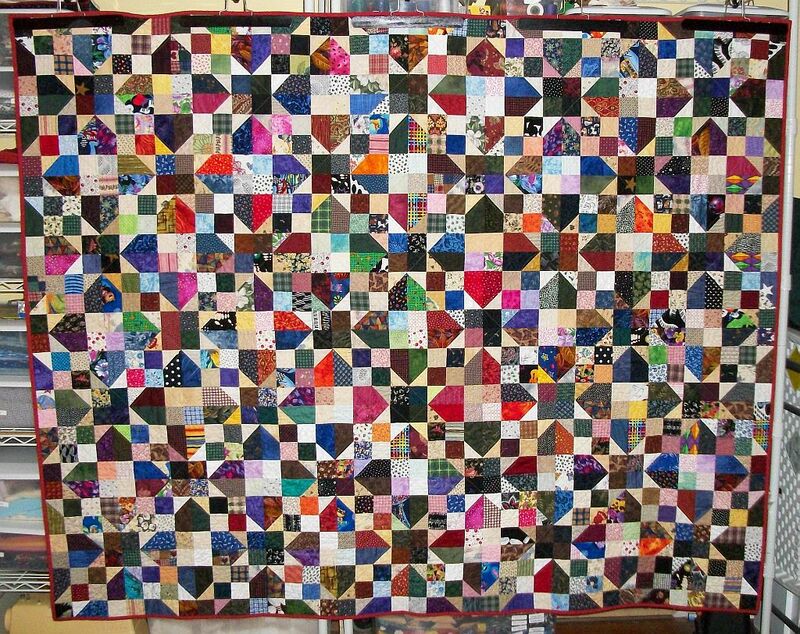 Since I don’t really want the quilt any bigger (although it could be about 5″ longer but don’t tell anyone), I think I will just bind it when it is finally quilted. The slice of red in the top left corner of the picture is the red fabric I’m planning on using. Posted by Pam in KC in designwall, Oklahoma Backroads, SBS. The Design Floor had Oklahoma Backroads on it for a photo. It’s in 8 pieces and I’ve got it pinned for the next 4 seams. Later this week I think I’ll be asking for advice on a border. 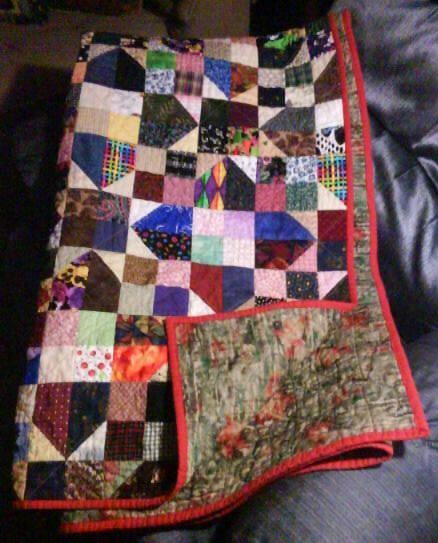 Right now I’m leaning toward no border and a red binding — the same red that I used as the cornerstones in my Texas Braid. On the Design Wall I have 6 blocks from Row A of Sylvia’s Bridal Sampler. I hope having them up on the wall will encourage me to get the other four blocks from Row A done sooner than later. See what’s on other design floors, walls, bed, tables by checking out the links over at Patchwork Times. Posted by Pam in KC in designwall, Oklahoma Backroads. Literally nothing today – except threads. 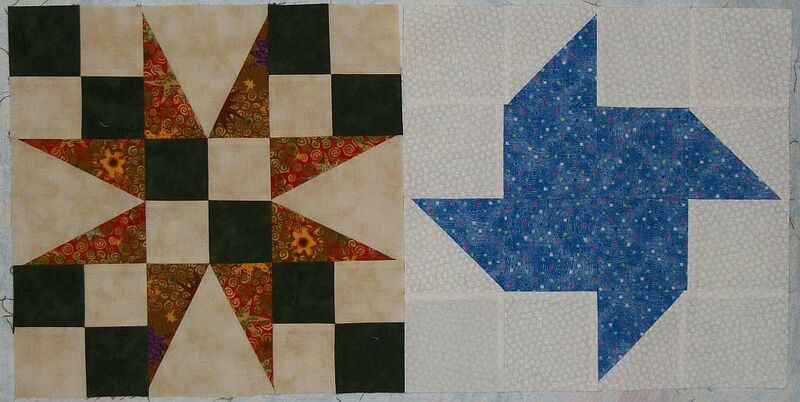 I’ve started sewing the Oklahoma Back Roads blocks together that I showed yesterday. Posted by Pam in KC in Bonnie Hunter, Oklahoma Backroads. Yesterday’s plan was to work on Star Struck. However, in cleaning up the sewing room, I found a stack of blocks that needed to be contained in a project box. I grabbed an unlabeled box and found my Oklahoma Backroads blocks. 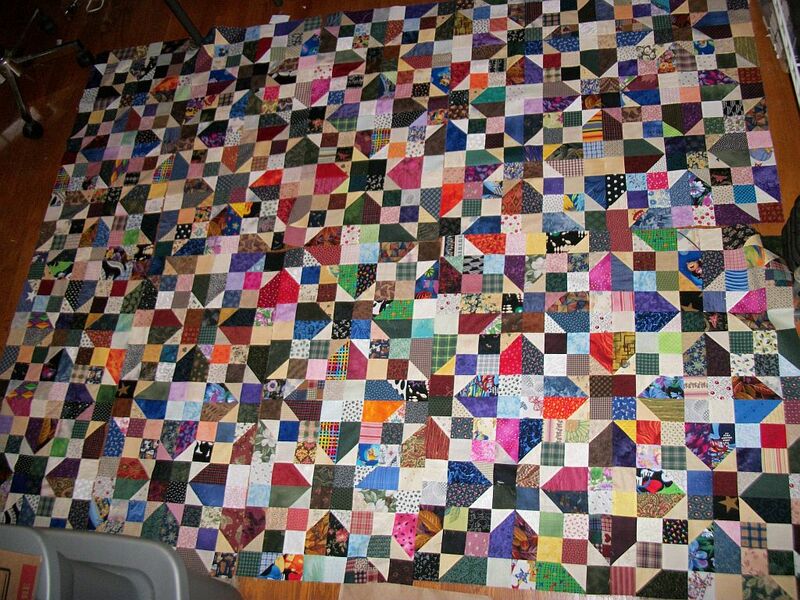 I finished up the last 20 blocks, so now I’m ready to start sewing them together. 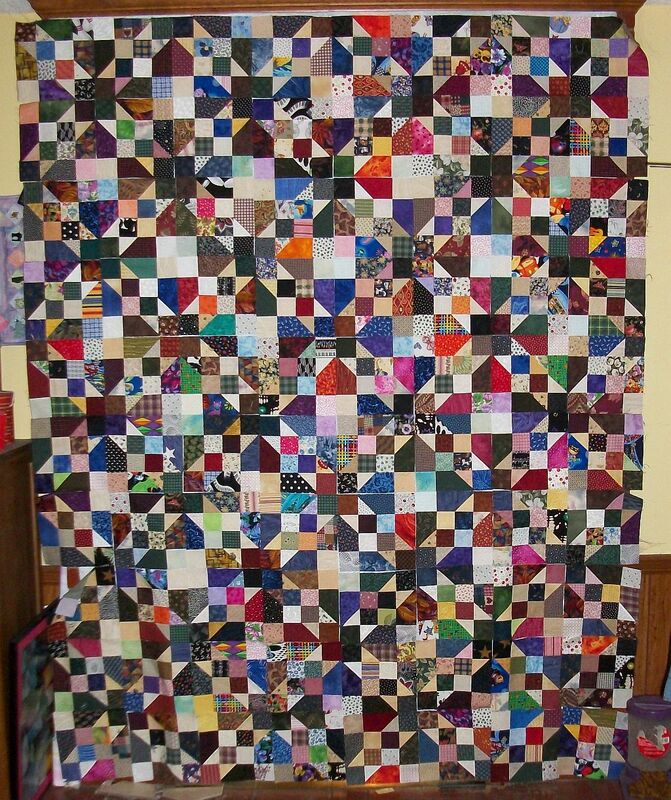 I started working on this quilt as a leader/ender project back in October. It is a Bonnie Hunter pattern that you can find here. Posted by Pam in KC in Dancing Flowers, designwall, Oklahoma Backroads, Texas Braid. I can’t make up my mind what I’m working on. 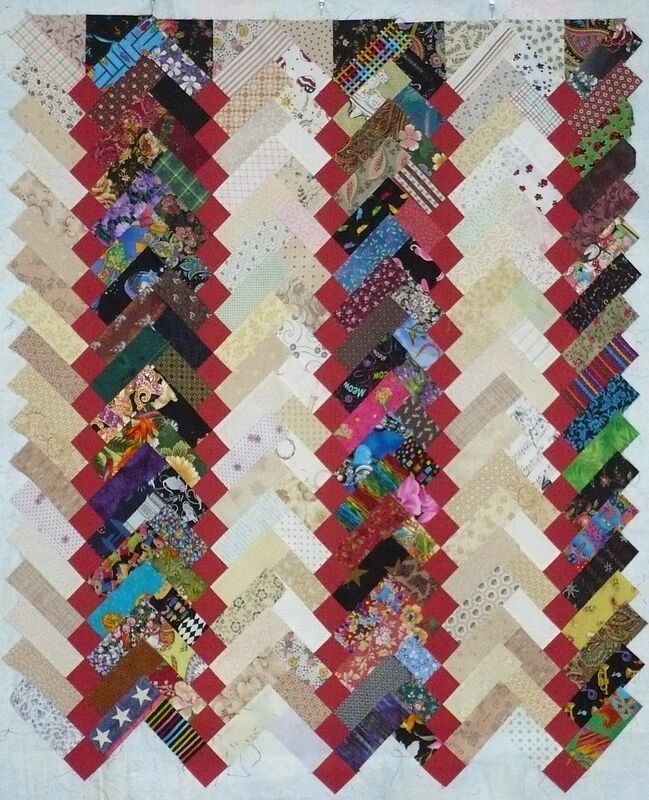 All weekend I had the 50 blocks I’ve completed for Oklahoma Backroads on the design wall and I was quilting Dancing Flowers. Additionally, I’ve been working on my red scraps. In addition to my usual sizes, since I’m working on the reds, I’m cutting 1 1/2 inch squares to use as the centers of log cabin blocks. But sometime Sunday afternoon I decided I needed to work some more on my Texas Braid. Hop over to Judy’s to check out other design walls and see if anyone else is having trouble staying focused on a single project.